Stephen Owens was 12 years old when he found his father badly beaten with a tire iron and struggling for his life on the floor of their home. Investigators traced Ron Owens’ murder to a mechanic with a rap sheet. Stephen’s mom, Gaile, hired him for the hit. To those who knew them, the Owenses were the model Christian family in Memphis, Tenn. They attended church, where Ron coached the basketball team and Gaile sang in the choir. 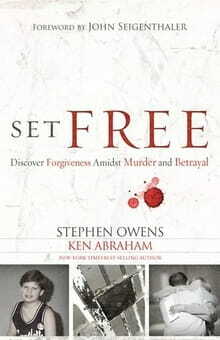 Yet the 1985 murder sent Gaile to death row, and left Stephen living with his aunt. From that point on, Stephen hated his mother. He wanted nothing to do with her and her pending execution. He considered her already dead. But 17 years later, as Stephen “experienced an increase in my desire to grow in my relationship with Christ,” his heart began to change. It began with the birth of his first son, Zachary. “Clearly God … spoke to my heart in a way that made my mind want to act,” Stephen said. “It was the first time I felt something internally to think of Mom in a light outside of hatred. I wanted her to know she had a grandson.” He sent a message in a Christmas card with a photo of Zachary. From then on, mother and son corresponded for several years through letters. Inside the prison, God was changing Gaile’s heart as well. Instead of giving up hope or rebelling against the system, Gaile took the less-traveled road of confession, repentance, and submission. She joined a Bible study. She invested in the lives of other inmates at the Tennessee Prison for Women and worked hard to make a difference with the time she had left, which dwindled to months and weeks. In the meantime, Stephen was offered a job to teach in a prison and he realized many of the prisoners were just like him. When he began teaching in a Christian school, he learned one of his co-workers was leading a prison Bible study his mother attended. Convinced that the forgiveness Christ taught didn’t allow him to pick which wrongs to forgive, Stephen finally decided to visit his mom, eight years after he sent that first Christmas card. After a 23-year separation, they embraced. They voiced their sorrows, and they forgave. Three months later, the governor commuted Gaile’s sentence to life in prison with the possibility of parole. With time off for good behavior, she walked free on Oct. 7, 2011. Today, Gaile Owens lives with the regret she knows she will always carry, but her role as a mother and grandmother is restored.